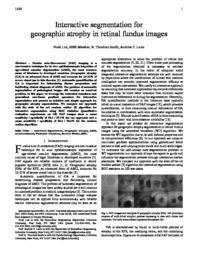 Fundus auto-fluorescence (FAF) imaging is a non-invasive technique for in vivo ophthalmoscopic inspection of age-related macular degeneration (AMD), the most common cause of blindness in developed countries. Geographic atrophy (GA) is an advanced form of AMD and accounts for 12-21% of severe visual loss in this disorder. Automatic quantification of GA is important for determining disease progression and facilitating clinical diagnosis of AMD. The problem of automatic segmentation of pathological images still remains an unsolved problem. In this paper we leverage the watershed transform and generalized non-linear gradient operators for interactive segmentation and present an intuitive and simple approach for geographic atrophy segmentation. We compare our approach with the state of the art random walker algorithm for interactive segmentation using ROC statistics. Quantitative evaluation experiments on 100 FAF images show a mean sensitivity / specificity of 98.3 / 97.7% for our approach and a mean sensitivity / specificity of 88.2 / 96.6% for the random walker algorithm. Conference Record of the 42nd Asilomar Conference on Signals, Systems and Computers: October 26-29, 2008, Pacific Grove, California (Piscataway, N.J.: IEEE, 2009), pp. 655-658.